The weekend that the gig ended in Andalusia, Hank got drunk and Audrey pitched a fit. Hank threw her clothes in the mud in front of the trailer. She called the police and had him put in jail. I had to go get him out. I was embarrassed, but I went back in there. He was sitting on a bench in his cell, watching me. I didn't know what to say, but he was starin' at me. He said, "What do you want me to do? Stand on my darn head?" I paid the thirty dollars and got him out. One of the policemen said, "Come back 'n' see us, Hank." He said, "All of you can go to Hell." The final paradox is this: Hank Williams left no journals, almost no letters, and no extended interviews, and the people who knew him best have to admit that on some level they didn't know him at all; yet, for all the ambiguity and unknowableness, Hank Williams appears almost desperately real through his music. He escaped the obloquy of seeing his drunks and his dalliances splashed over the tabloids, but he left a life diarized in verses sung with such riveting conviction that we feel as though we know him well. At his best, he froze a moment or a feeling in terms simple enough to understand quickly, yet meaningful enough to listen to forever. 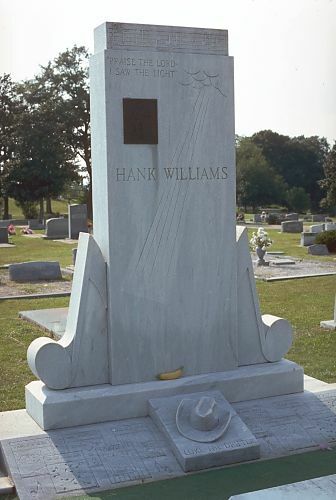 After he was gone I remember the Hank Williams Days. Those were some big parades down in the south for a five or six-year-old to be involved in, and they had a big influence on me. Everyone's touching you and crying, and that's when I started wondering "Who was this man?" In the late fifties when I was going to school in the morning, there would be a busload of people in my front yard, and I would ask, "Who are those people, Mommy?" I slowly started to realize that everyone knew him, and I needed to know him, but then I was in a bus touring myself. Listening to his songs became my real education process. You can hear anything, you can read anything, but if you sit down and listen to his albums, you'll know him, and you can make your own analysis. Just listen, you don't need anyone to explain anything to you.